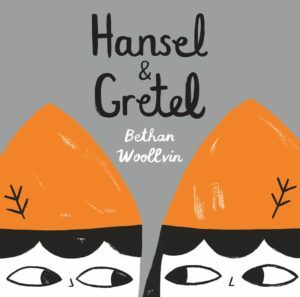 Hansel, Gretel, Witch, gingerbread … You know the story, right? Maybe not. This isn’t your grandmother’s fairy tale. The author takes this opportunity to describe a world in which Willow is a good witch who only wants to protect her home and keep her magic safe and practical. The kids, however, want to wreak havoc, which they do very well. Their breadcrumbs bring a flock of birds, endangering the gingerbread house. Of course, Hansel and Gretel start chewing on the gingerbread anyway, plus anything else they can take sink their teeth into. “But Willow did not get angry, because Willow was a good witch.” Willow takes an awful lot of abuse before she decides to take revenge. The wonderful details in the illustrations add to the fun. Ghosts and skulls and spell books, oh my. Kids will probably not get all the humor in this delightful gem, but they will understand that it’s very funny. As a follow up to Little Red, it’s especially wonderful. Someone once said you know you’re an adult when people stop asking what’s your favorite dinosaur. Maybe they didn’t know about this adorable new book. Even the end papers exude dinosaur-ness, showing and naming twenty-eight different dinosaur shapes. When an egg rolls away from its nest, it asks various dinosaurs if it belongs to them. 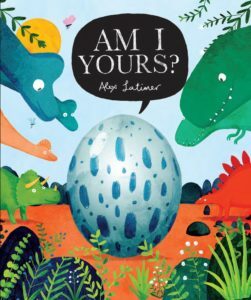 To help the egg along, each dinosaur asks if the infant inside has one distinguishing feature of the adult dino. Of course, several dinosaurs decide the egg is not theirs, but they end up helping the egg back to its home. The clever rhyme works well, as do the entertaining illustrations. In this heartwarming story of family and community, readers will learn about the dinosaurs, about solving puzzles, and about helping those around us. It’s a great read, whether independently or as a nighttime read aloud. Gray whales migrate possibly the longest distance of any mammal – approximately 12,500 miles between the Arctic and Antarctic. This cute tale of a newborn calf and his mother follows them on that very long trek. Like a small child, the little whale keeps asking if they are home yet. Along the way, they encounter beautiful underseas forests, artfully illustrated. They also come across coral reefs, large open expanses, large ocean liners, huge schools of fish, and a group of orcas. The mother must protect the little one and encourage him to keep going. When they finally join the other whales, they greet each other with song. With the illustrations helping to tell the story, this book is great for independent reading. It’s also helpful for an introduction to sea mammals in a science unit. But, with the quiet tones and the somber colors, the best use is probably as a read aloud at bedtime. 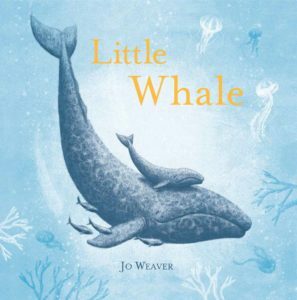 In any case, it lets the reader know what hard work, perseverance and abiding love can do for whales, or even for humans. Another in the nature series, this is another great view of one of the world’s environments. Beautifully illustrated and combined with counting and geography, the facts about each creature’s behavior are a delight to learn. 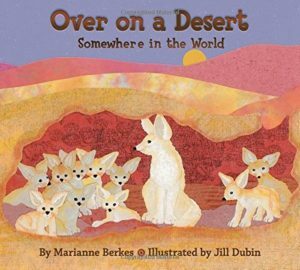 The singular idea that deserts are not as barren as many believe is enough to make this book worthwhile. The author takes a few liberties with animal facts for the sake of rhyme, making the Fact or Fiction? section necessary. The “hidden” animals are additions to the illustrations/landscape presented partly to add to the fun. The author highlights numerous activities in her note at the end to suggest further study. The illustrator and designer both have great stories to relate about their adventures while conducting research for this project. The last section shows how the text can be set to music. This is a wonderful addition to study of climates and animal diversity. The push toward diversity in children’s literature has the happy result of enlightening everyone about cultures they probably only have a fleeting familiarity with. 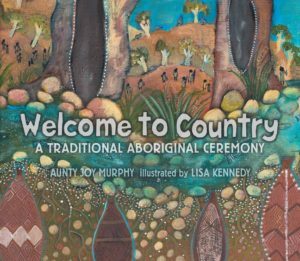 This fascinating picture book, written and illustrated by indigenous Australians, is one that has that effect. Murphy is an elder in her community and is wonderfully conversant in their ceremonies. She holds numerous government positions related to her status in the community. She is called Aunty out of respect. This particular ceremony is the one that welcomes visitors. She uses native language interspersed with English so that the reader can understand what’s going on and still get the flavor. The ceremony is slowly revealed as many basics are explained to the visitor. Bunjil the eagle is our creator spirit. Bunjil created man, woman, and child from the land. Kennedy uses traditional motifs to produce unbelievably beautiful images to draw the reader into the indigenous world.